Many people deem snakes problematic because they are unsure whether or not the species they have encountered is venomous. That being said, snakebites are actually rare, typically occurring only if you have been harassing the snake or accidentally trampled it. 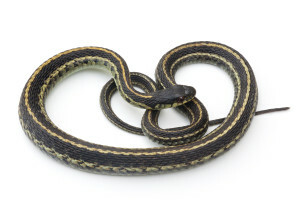 In addition, only 16% of snake species in the United States have a poisonous bite. Be that as it may, it’s never safe to assume that a snake is not venomous if you know nothing about it. Venomous snakes found in the Midwest include the Copperhead and the Cottonmouth, as well four species of Rattlesnake (pigmy, prairie, massassauga, and timber), all of which belong to the Viperidae family, more commonly known as pit vipers. Distinguishing characteristics include a broad, triangular-shaped head and heat sensory pits, midway between the nostril and eye on each side of the head. Rattlesnakes, of course, will have a tail rattle. If bitten by a venomous snake, the American Red Cross recommends that you wash the bite with soap and water, immobilize the bitten area and keep it lower than your heart. And most importantly, get immediate medical attention. Non-venomous snakes common to the Midwest include the garter, ribbon and green snakes, corn and bull snakes, king snakes, and water snakes to name a few, all of which belong to the Colubridae family. Despite the fact that an overwhelming majority of snake species are non-venomous, few people have any tolerance for snakes on their property, especially if children play there. An encounter with a snake often stems from the presence of rats, mice, or other prey animals. Taking measures to control the rodent population is typically the best preemptive step toward eradicating a snake problem. Snakes can make their way through very small openings. So, in addition to limiting food sources, structural gaps any larger than ¼ of an inch, located within three feet of grade should be filled. An inspection should be performed on your home or business, in order to locate any potential access points, or evidence of an attraction to snakes, such as the mice and rats mentioned above. Besides physically capturing the animal in question, alternative methods for catching and/or deterring snakes from entering your home or business include repellants and large glue boards.